Japanese Throwing Weapons is a detailed instruction manual for learning authentic shuriken throwing techniques as practiced in Japan. Daniel Fletcher studied under Japan's most notable shuriken sensei, Yasuyuki Otsuka, of the Meifu Shinkage Ryu and in this book he reveals the secrets learned in his years of study and training. 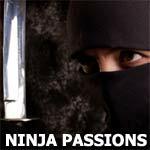 Fletcher explains the origins and purpose of the shuriken as a weapon and provides information on the various types of shuriken used by the historic samurai and ninjas. Fletcher's expert instructions and the enclosed DVD can help anyone become proficient in throwing these weapons.